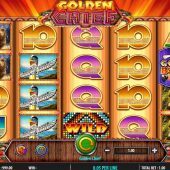 Golden Chief slot gives us the spectacular background of the Western Plains with tepees and totems of the native Indian communities silhouetted by the sunset as we embark upon a visit to the Ancient Americas. Rather oddly, even given that Barcrest are part of Scientific Gaming along with WMS, we hear the same soundtrack as WMS's Bruce Lee as we spin although fortunately the animations are different! The reels are filled with the expected icons for the theme but these brave warriors won't give up their gold without a fight, so will it be The Peace Pipe or Tomahawk for our cash reserves? As usual with Barcrest it's never simple and the pay tables and lines change depending on what amount we bet. If we bet less than 1.00 then there are 10 paying lines, 1-2.00 then 20 lines. Not only that, but the 5-of-a-kind awards do too. So I will give you two figures for each, for more than 2.00 and less than 2.00 respectively: Card values except Ace pay 20/10x line bet, Ace 30/15, Brown Bear or Totem 60/30, Hiawatha 80/40 and Wild or Wild Expanding Chief 500/250 coins for a full line. 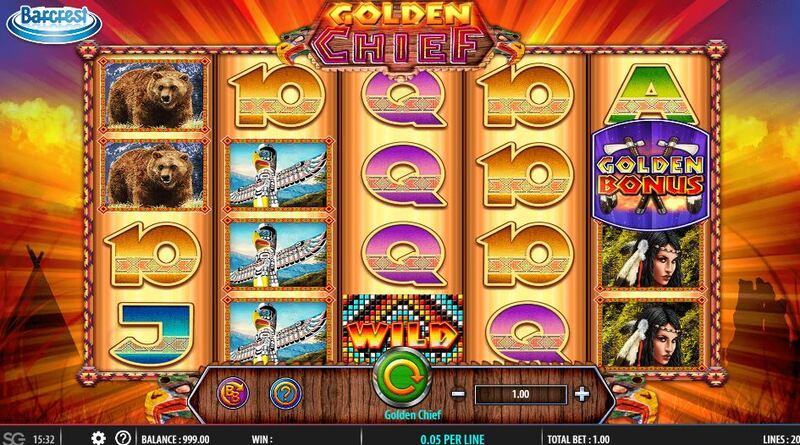 The Chief Expanding Wild appears on all reels and when counting in a win will change the slot for that spin to 50 lines if betting more than 1.00, or 100 lines if 1.00 or more. When this Wild appears you may also get a random symbol upgrade whereby any single card value in view may disappear and upgrade to a picture icon except the Wild. As well as the Chief Expanding Wild we also get stacked Wilds on all reels. And just when you think it couldn't get more complex, there is the Big Bet option where you can buy 5 spins for 20, 30 or 50.00 and the pays are reduced pro-rata to the values shown above. Free Spins - 5 or 10 depending on your bet level. You can gamble these to a maximum of 30 spins in all cases. Chief Wild will expand sideways too now, and fill all reels possibly! Cash Canyon - Spin the wheel to advance along a trail, like the Leprechaun Bonus on Rainbow Riches. Totem Riches - 3 Totem Poles with x line-bet values appear, you pick any one and if not hitting 'collect' you can choose again and so-on. All the above features will be enhanced if you bet 2.00 or more, thus getting an extra life in the Totem, higher values in Cash Canyon and starting with 10 free spins instead of 5 in that feature. The game picks the feature for you! If using the Big Bet to trigger the bonus you will get Sticky Expanded Chief Wilds too in the free spins.